Being able to create and share your ideas in an instant, elevates your artistic freedom to a new level. We developed the LEWITT Recorder to make sure that every idea is recorded in high studio quality and can be refined with studio-quality effects later on. All you need is your phone. Download the free trial version right from the App Store. If you like what you see, get the Pro Version safe an convenient as an in-app purchase for just 4,99 USD. 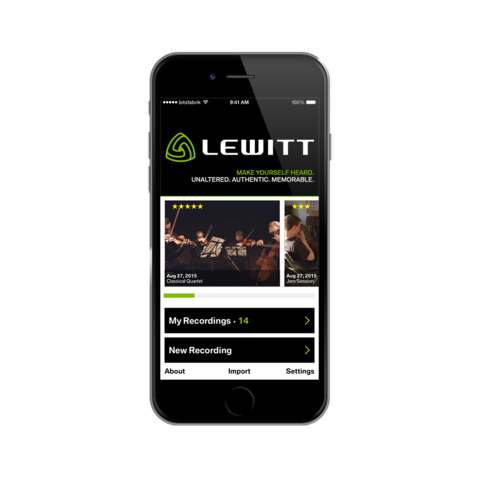 The LEWITT Recorder provides professional and uncomplicated high-end recording at home or on-the-go in studio quality with sample rates up to 96 kHz and 32 bit. Refine your recordings with studio quality effects for a pleasant sounding mix in an instant. Our DGT-series devices, with their high-quality microphones, cover the entire hardware-side of the mobile recording process. The DGT 450 provides all the features of a high-end USB microphone, while the DGT 650 – the only stereo USB microphone with built-in audio interface on the market – is more than you would ever think to ask for. The LEWITT Recorder allows you to adjust the input and output gain of the iPhone's built-in microphone. Add a compressor and you have the perfect setup to conduct interviews – in perfect quality. Place markers and add notes to prevent moments from getting forgotten or being hard to find. To make sure your ideas do not get lost in the past, we have included a well-conceived archiving system for fast and efficient searches. You can add notes, ratings, tags and photos to every recording. That way it is a quick thing to re-access your sessions. Don’t forget - you might already have that hit song in your pocket! Export your files in lots of different formats (MP3, AAC, WAV, etc.) and transfer them via E-mail, iTunes, or direct upload to SoundCloud. Share your music. Make yourself heard.